Anytime the safety briefing for a media event includes instructions on how to bail out of an airplane, you know you’re in for a fascinating and (potentially) free-falling story. Luckily, the insurance people at GEICO had every conceivable angle covered for a media-day demonstration ride with the GEICO Skytypers. The GEICO Skytypers are in nearby Reading, Pennsylvania this weekend for the 27th annual Mid-Atlantic Air Museum World War II Weekend. The largest event of its kind, the World War II Weekend has long featured an array of historic aircraft associated with the second world war. Billed as “A Gathering of Warbirds”, perennial favorites at the show include the Boeing B-29 Superfortress “Fifi”; the Boeing B-17 “Yankee Lady”; the North American B-25J’s “Briefing Time”and “Panchito”; the iconic Chance Vought FG-1D “Corsair”; and the North American P-51D “Mustang”. 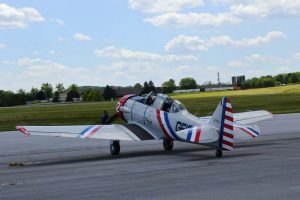 With its focus on offering air show audiences an assortment of historic aircraft, it came as a surprise that this will be the first appearance in Reading for the GEICO Skytypers. For one thing, classic airworthy ships are getting harder to find. 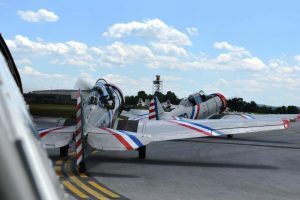 And unlike precision military teams which rely on modern jets, such as America’s Blue Angels or France’s Patrouille de France, the GEICO Skytypers fly the hardy WWII trainer: the North American SNJ-2. Thomas said the Skytypers flew into Reading from their home base in Farmingdale, New York – a trip of about 125 miles. “As a trainer, these planes were not designed to go for extended flights. Basically, they wanted the student pilots to get up in the air, learn to fly and get safely back down on the ground”. 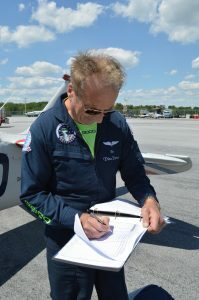 Tom Daly – Lead Solo Pilot for the Syktypers team – told the Baltimore Post-Examiner that flying was his first love. 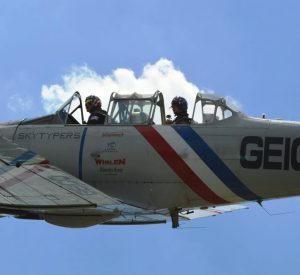 Daly referred to the Skytypers’ aircraft by its Army designation – the “Texan” T-6, noting that pilots who went on to fly P-51s and P-47s honed their skills in the nimble trainers. “They called these planes “The Pilot Maker”, said Daly. “Some countries even used them as their primary fighter aircraft for their air force”. Daly said the demonstration ride would give this reporter a chance to experience many of the moves the Skytypers employ when putting on their air show. Daly was quick to point out the Skytypers are not an acrobatic team, but rather aerobatic, in that they use the traditional training maneuvers while “typing out” their airborne messages. With this helpful background, we were ready to sign the requisite paperwork, then suit-up for the 30-minute flight. Handling flight prep was Pilot Steve Kapur. My fellow journalists each raised a hand. This reporter put his hand up twice. “You’ll be issued flight suits, a helmet and one of these disposable helmet liners. After the flight, you can keep the helmet liner”, he wryly chimed. Kapur then proceeded to go over the information we had gleaned from the 12-minute video. Though we would be flying over land, we were required to wear an inflatable life vest. This seemed counter intuitive, but there is a practical application: once inflated, the life vest offers additional protection in the case of an emergency “exit”. Another seemingly odd consideration was the placement of zippered pockets at ankle level. Dutifully, each journalist inserted essentials into the low-sewn pockets. I put spare camera batteries and memory cards into one side – my newsboy cap into the other. I guess I figured if I had to bailout and ended up adrift in the Lititz Run, I’d have fresh batteries for my water-soaked Nikon, and the cap to keep the sun out of my eyes. Kapur next went over the use of a parachute. He assured us that the box design we’d have strapped to our backs was easy to control and would provide a gentle landing if we remembered to turn it into the wind. I looked at my fellow journalists. Why did we initial that no fault clause? Our briefing complete, we were ready to fly. I was assigned the number six plane – piloted by Alternating Opposing Solo Pilot Dino Peros. All kidding aside, I discovered that Peros is a highly skilled pilot. 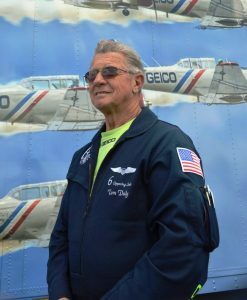 A retired Naval Aviator, Peros flew both the A-4 Skyhawk and the AV-8B Harrier during a thirteen year career with the Marine Corps. Once firmly entrapped by a series of belts and harnesses in the rear seat of the two-man SNJ-2, Daly stood on the wing to orient me to the unfamiliar surroundings of the cramped cockpit. The SNJ-2 may be flown from either the front or rear seat position. For safety’s sake, Daly asked me to remove the stick and to keep my feet off of the rudder pedals. I was also told how to operate the radio, and about the use of the canopy. For this once in a lifetime experience, I opted to keep the canopy open. We would not be flying so high that either the cold or oxygen would be an issue. Plus, with the canopy open, I’d have a clearer view of all the action. With a signal from the control tower, our flight of four single-engine trainers slowly taxied down the runway. For a moment, the winds noticeably picked up, and the radio chatter hinted a delay was in order. But just as quickly, nature somewhat relented and we were soon climbing toward the clouds. Circling the sky over Reading, we had a birds-eye view of both the ground below and our fellow travelers. The pilots altered wing-to-wing formations with soaring ascents and solo turns. Each journalist was given the chance to get an assortment of shots from multiple positions. Aiming my camera in a 180° arc from left to right and then front to back through the wind and the plane’s vibration, I quicky realized the extreme difficulty air gunners must have faced in training their weapons on fast moving opponents. The high winds notwithstanding, the short flight was exhilarating and the sky above us was truly spectacular. It’s easy to see why rides such as this in vintage aircraft remain one of the most highly sought extras at air shows like the one in Reading. Once on the ground, I had a chance to personally thank Captain Peros. Peros told me that his experience with the SNJ-2 goes “way back”. The press event complete, I said my ‘Thanks Yous’ and made my way back to Baltimore. I didn’t earn my wings, but I got some beautiful shots with my camera and a handsome certificate to boot. Peros assured me that I made a great wingman. I jokingly told him if anyone asked, I would vouch for his competency as a pilot. Not a bad day, really – even if I didn’t get that coveted chance to bail out. 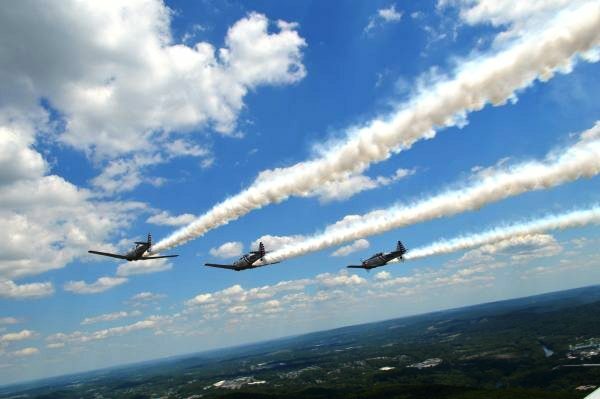 The GEICO Skytypers will be appearing Friday – Sunday at the Mid-Atlantic World War II Weekend. The event will be held – rain or shine – in nearby Reading, Pennsylvania. More information may be found by visiting MAAM online. The Skytypers will return to the Baltimore/Washington area in mid September. Information about their schedule may also be found at GEICO Skytypers.